I have been working out since college. I went to the gym five times a week, but I felt my routines were dull throughout the years. I got busier when I had my first job. My work demanded almost half of my day. Going to the gym weekly was once a priority that became an option. My body was not fat, but it also wasn’t lean either. I became complacent and ate more than what I need because of my high-stress levels. Slowly, I was increasing in size, but I cannot give ample time to go to the gym. I had struggles of shedding my stubborn fat, especially the ones around my lower body. I wishfully thought for an effective training I can do for less than an hour. I tried to ask for recommendations, and I discovered this DVD. At first, I doubted if this could be effective for 30 minutes. But after reading the positive reviews of other people, I did not hesitate to buy this fitness program. INSANITY MAX:30 promotes a 30-minute workout for 60 days. It contains 12 separate workouts in 10 DVDs. They are divided into two two months. The first month focuses on establishing and alternating cardio and Tabata-style strength workouts while the second month still has longer exercise intervals with the same goal. This fitness program strikes a balance between improving all body groups simultaneously, unlike other training programs with isolated movements. Each minute and each day count. With an estimate of 150 compound cardio and resistance moves, I felt the whole program burned my body fat faster and toned my muscles in my core, legs, glutes, arms, and other body parts. This program is doable without any equipment. The first workout is the Cardio Challenge. I have to agree that it was the hardest cardio workout I have done with the program. During the first minute of warm-up, I was already gasping for air. The second is a strength training called Tabata Power. It uses time intervals of “20 seconds on, 10 seconds off”. My muscles were always sore, but I was challenged to repeat this workout. They say it is better to be sore than sorry. The third, or Sweat Intervals, is a more intense variation of the Cardio Challenge. I already felt the burning of extra calories during the first few minutes. The fourth, no rest workout, is the Tabata Strength. It is unlike the Tabata Power that still gives 10 seconds rest every 20 seconds of execution. This exercise has become my longest 30 minutes of each week. The fifth is called the Friday Fight: Round 1. My hard work from Monday to Thursday served as preparations for culminating the week every Friday. There are no new routines. This workout does not work only on my body, but also pushed my mind to keep going. The battle was always between my mind which wanted to fight and my body which wanted to surrender. Max Out Cardio is the sixth workout, which signals the second month. This is the more insane version of the Cardio Challenge. Max Out Power works like the Tabata Power, but the intervals are longer with the “45 seconds on, 15 seconds off” technique. This is the seventh. Max Out Sweat is the eighth. It works twice harder than the Sweat Intervals. Max Out Strength is the upper body counterpart of the Max Out Power, which uses the “45 seconds on, 15 seconds off” Tabata-style routine. This is the ninth insane. Friday Fight: Round 2 is harder than Round 1. This was always a battle between my body giving up and my mind pushing harder. It is a more epic battle than Round 1, indeed. I almost fainted after doing the first workout. However, as I have read and followed the instructions carefully, I was able to adapt to the intensity of the whole program. There are two bonus workouts which helped my body recover from the ten tiresome workouts. Pulse is the Saturday recovery exercise that focused on stretching and small but burning pulsing movements. Ab Attack is the longest 10 minutes of my life where my core became sore but stable. I usually partner this with cardio workouts. Working out without a goal is a big waste of time. With Max Out Wall Calendar and Max Out Tracker, I learned to set goals by monitoring my training schedule and weight loss progress each day. The calendar and the tracker emphasized the need to be committed to working out each day. For healthy food choices, Nutrition to the Max Guide uses the portion control: vegetables and fruits, protein, carbohydrates, and a subtle amount of fat. Eating has one fundamental principle: everything must be in moderation. I still get to eat what I love and achieve my fitness goals, but there are times where I have no time to prepare my meals. No Time to Cook Guide provided a guide to choosing the right kinds of fast food to prevent compromise of my fitness goals that solved this problem. Most workouts aim to achieve weight loss. However, they differ on the intensity and time frame in producing desirable results. It taught me to eat smart. I did not have insane diets, but I focused on improving my eating habits by training my taste buds for better alternatives. The additional guides maximized the effects of my daily 30-minute routines. This workout brought fast changes to my body. I already lost weight during the first week. It made me stronger and faster in performing body-weight exercises. After I had finished the whole workout, I realized that this program is not for beginners. You should have at least experienced cardio and resistance training before trying this. It is not recommended without consulting the doctor first. I also disregarded one of the most valuable advice - first to consult the doctor. During the first month, I was disappointed because I did not lose a significant amount of weight for the first two weeks. However, when I modified and followed the Nutrition Guide, I began to see changes in my body. I also tried to get rid of sweet and salt, which gave me the body I always wanted. 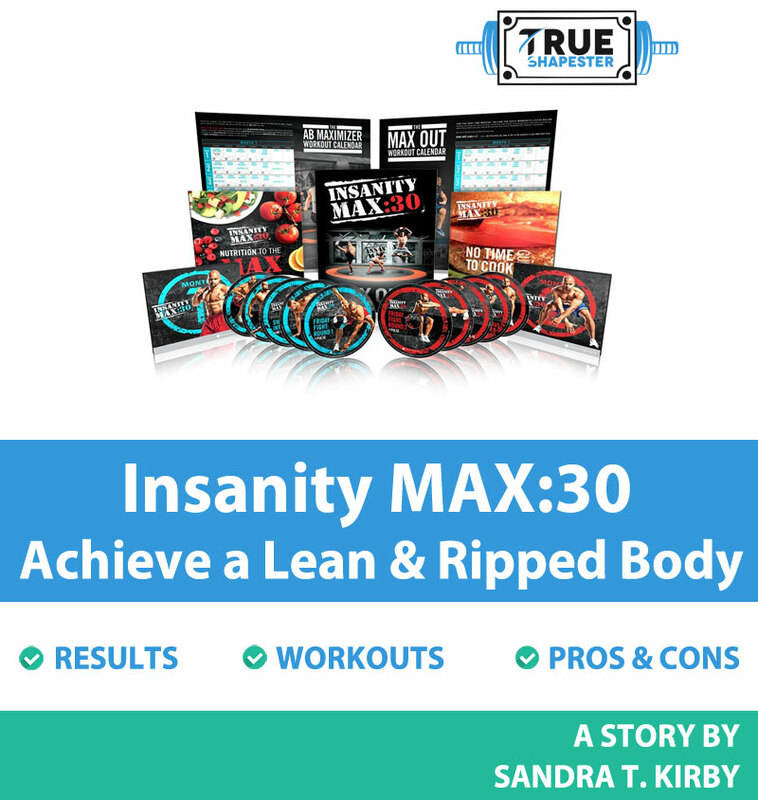 INSANITY MAX:30 is not only about performing the prescribed exercises to change my body. It is a program designed to change my mindset and habits. I was a quitter before. The workouts, especially the Friday Fight Rounds 1 and 2, helped me to become a fighter and a finisher. Everything became possible with the aid of the chief coach, Shaun T. This training did not only teach me to workout harder but to work smarter and dig deeper.